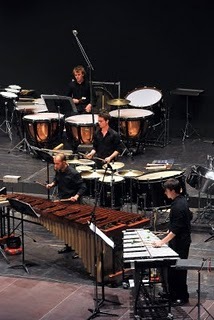 Festival Academy under the direction of Pierre Boulez and the guidance of the percussionists of the Ensemble Intercontemporain. At that time, they performed Pierre Boulez's Notations for Orchestra. From the success of Notations, the section was asked to return to the Academy in 2005 to perform the works of Varese. The enthusiasm for that performance was the impetus for the group's residency at the Lucerne Festival in 2006, 2007, and 2008. The group's work with Fritz Hauser on his piece Bricco Lu lead to experimental performances of structured improvisation in a variety of settings.